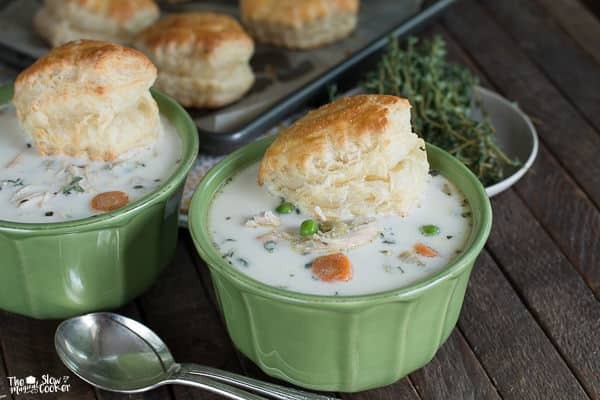 Slow Cooker Chicken Pot Pie Soup is creamy and delicious. Can be made into a freezer meal! Hi all! I have the third edition of Freezer Slow Cooker Meal of the Month here. 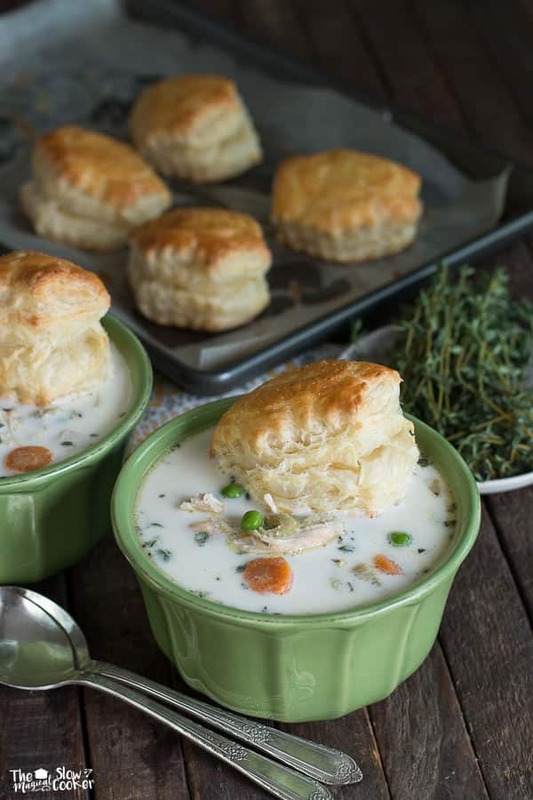 I made 3 bags of this Slow Cooker Chicken Pot Pie Soup for later in the month. The base of this soup can be put into freezer bags. I add the cream and peas after the soup has finished cooking, it freshens up the soup. Another reason I don’t freeze the cream is because it separates if frozen. I fold down the edge of the freezer bag so the edges don’t get dirty, and the bag will seal better. 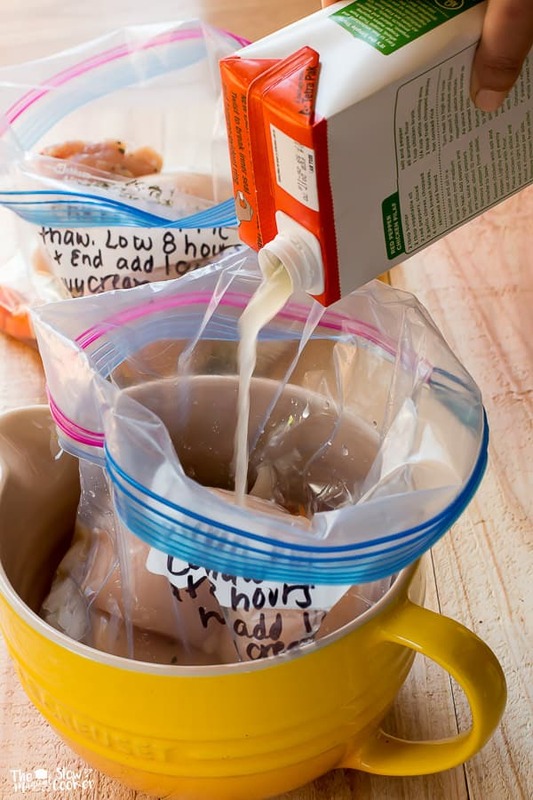 Before pouring the chicken broth in the bag, I put the bag in tall container. This keeps the bag from tipping over and everything spilling out. I often use old coffee cans for this if I have them. Or you can use stands that are especially made for freezer cooking, you can order them here. Remember for this recipe, don’t add the cream until after the meal has cooked. Below is the finished soup, with the cream and peas added. These are the puff pastry shells I used to top this soup with. They are very good freshly baked. I recommend only baking the puff pastries that will be eaten immediately, otherwise they taste stale even later the same day. What a perfect meal to come home to, with little effort especially if you choose to prep this meal in a freezer bag ahead of time. Place the carrots, celery, onion, basil, thyme, salt, pepper, bay leaf, chicken and chicken broth in to the slow cooker, stir. Cover and cook on LOW for 8 hours. After the cooking time is done add the peas, and heavy cream. Stir. Remove and discard bay leaf. 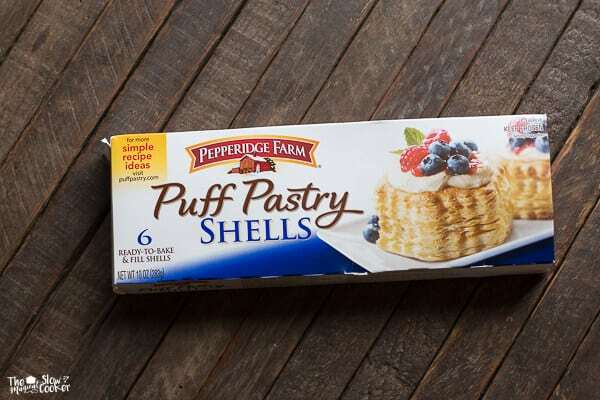 Cook the puff pastry shells according to packagae directions. Serve the soup topped with the puff pastries. 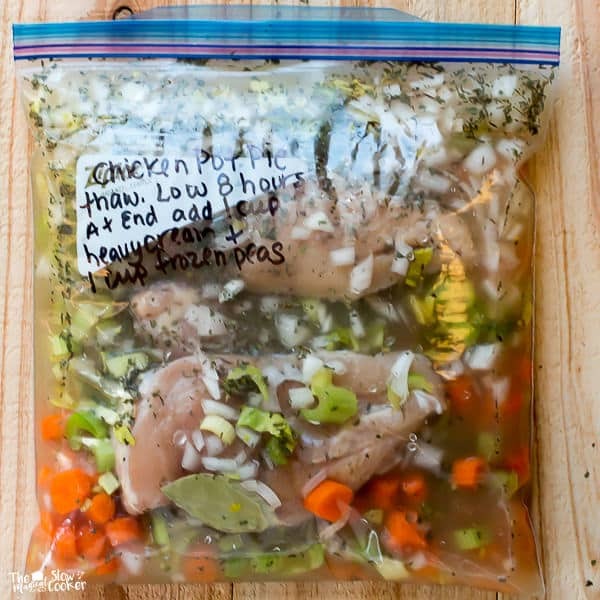 Place everything but the peas and heavy cream into a freezer gallon ziplock bag. Squeeze out all the air before sealing. Seal and freeze for up to one month. Mark on the bag that 1 cup of peas, and one cup of heavy cream needs to be added at the end of the cooking time. Write the cooking setting and length as well (Low for 8 hours). 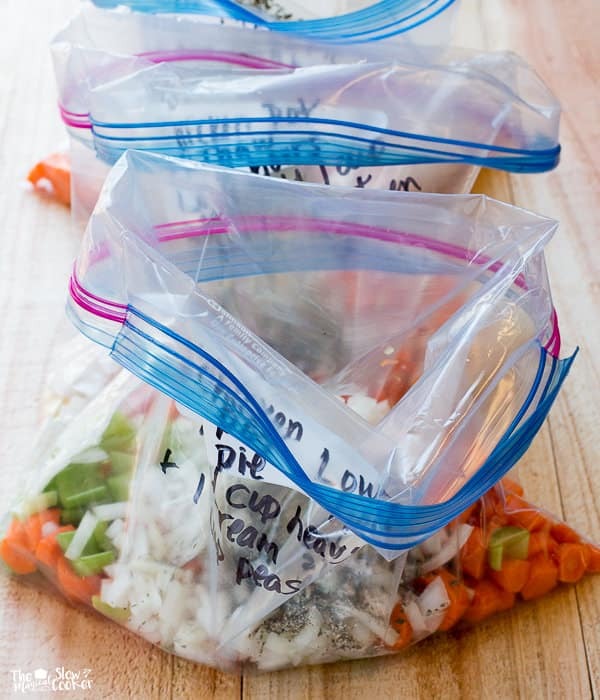 Place the frozen bag of soup in the fridge for 24 hours to thaw. 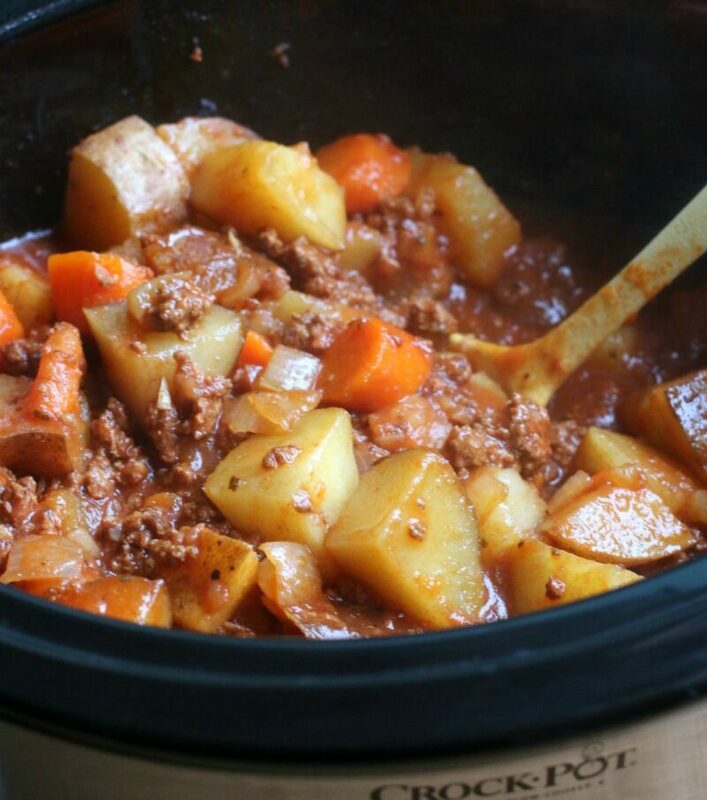 Dump the contents of the bag in to the slow cooker. Cook as directed above. 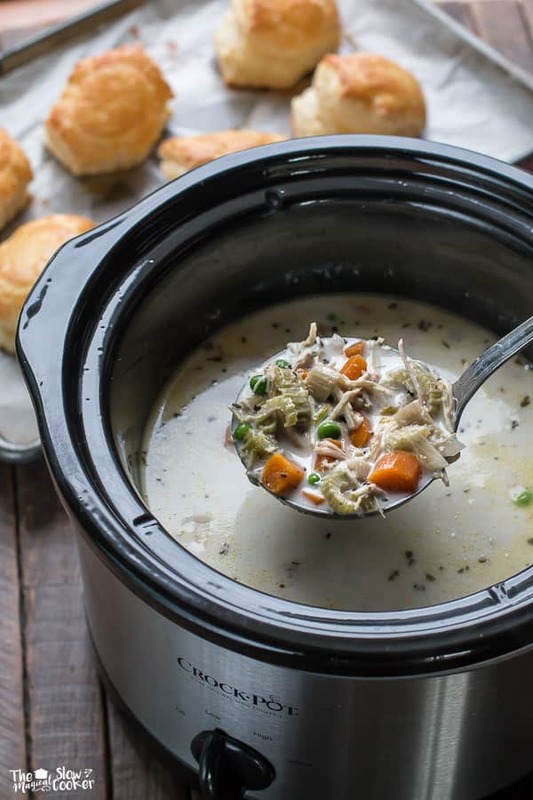 I used my 4-quart slow cooker for this recipe, but a large one may be used. My life just got easier when it comes to meal planning! I think my husband will even ‘cook’ if I have this prepared 🙂 Can’t wait to try this! I doubled this recipe for our after church crew, and every one loved it. I did a couple of things differently.. I precooked the chicken (to save cook time), and then thickened the broth a little. A great recipe that got thumbs ‘up’ from the whole crew! That’s so great to hear Amy!